One of the most common questions we get asked during a #physiotalk tweet chat is how best to keep up with the conversation and all the tweets that are being sent using the #physiotalk tag. Many people following the chat just using the search function of Twitter have struggled to keep up – and one or two didn’t get to see all the tweets during our chats as they weren’t sure how to follow the hashtag. One answer is to use one of the many websites or apps that allow you to follow a hashtag or chat more easily. 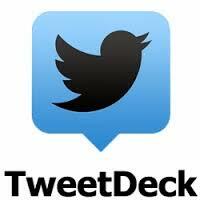 We use TweetDeck but others have said they use Hootsuite – it is a matter of personal preference and there are others out there as well, but here’s some information on how to get started with TweetDeck. 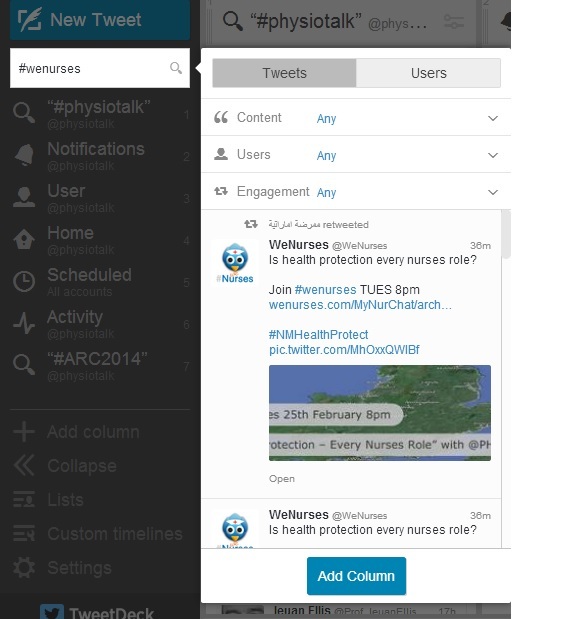 After you log in for the first time, you can then start to personalise your TweetDeck screen by adding columns. These can be used to manage multiple accounts, highlight your account notifications, find out whats trending or view activity for different hashtags. On the left hand side of TweetDeck you click on the +Add column (see picture above) and choose the type of column you want to add – we would recommend adding user, notifications and home as columns to start with. Don’t worry, it is easy to change your columns on a regular basis. If your right and list doesn’t look like the one below it is collapsed and you can expand it by clicking on the >> towards the bottom of the list. The column you have just added will refresh automatically and ‘find’ all tweets that contain your chosen hashtag – allowing you to follow the chat as it happens, or to view all the tweets associated with a conference or event. You can reply to, favorite and retweet any tweets you see in the column. You can see from the picture below I am currently following 2 hashtags – #physiotalk and #ARC2014 as well as my home column that shows me all tweets from the people I follow. 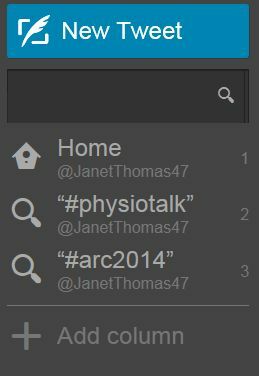 My TweetDeck home page currently looks like this…. Once you have added column it’s very easy to move them by dragging items up or down the left hand list. This list can also extended or collapsed to save space. You can remove a columns by clicking on the top right of an individual column and select remove. This way you can add a column for a specific chat and then removei t the next day if you are not following the hashtag every day. You can of course tweet straight from TweetDeck and even use it to schedule tweets for the future. Why not give it a try for the next tweet chat and see how you get on! If anybody uses Hootsuite please let us know how it works and we can add this information to the blog…. Thanks for this, easy peasy when you explained it, thanks!